Why do people notice an eye floater? What eye diseases are associated with eye floaters? What are the risk factors for developing eye floaters? What types of health care professionals treat eye floaters? How do health care professionals diagnose eye floaters? Can medication help to remove eye floaters? Can surgery remove eye floaters? Is it possible to prevent eye floaters? The structures in the front of the eye (the cornea and lens) focus rays of light onto the retina, the light-sensitive tissue lining the inside of the eye. Light coming from images around us focused onto the retina allows one to see. The light going to the retina passes through the vitreous humor, which is a jellylike material that occupies the back two-thirds of the eye. At birth and during childhood years, the vitreous gel is usually totally clear and transparent. Later in life, strands, deposits, or liquid pockets very commonly develop within the vitreous gel. Each of these changes in density casts a small shadow onto the surface of the retina, and these shadows may be perceived by the patient as eye floaters. They are usually light black to gray in color. As the eye moves from side to side or up and down, these strands, deposits, or pockets also shift in position within the eye, making the shadows move and appear to float or undulate. 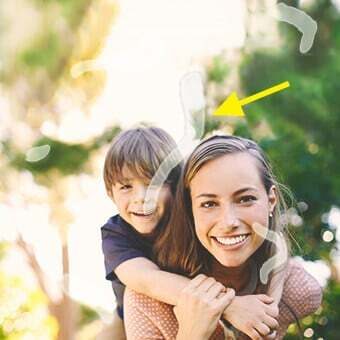 People describe eye floaters as black spots or specks in the vision, spots in the eyes, straight and curved lines, cobwebs, strings, or "O" or "C"-shaped blobs. Some people see a single floater while others may think they see hundreds. The lines may be squiggly, thick or thin, and they sometimes appear to be branched. To most people, they appear as various shades of gray and are darker in color than the background. The density of different eye floaters will vary within an individual eye. An eye floater may be more noticeable under certain lighting conditions and be more apparent when looking at a bright sky. Floaters are rarely seen in situations with reduced illumination. Like fingerprints, no two people have identical patterns of eye floaters. If a person has eye floaters in both eyes, the pattern of the eye floaters within each eye will be different. In any eye that has eye floaters, that pattern of eye floaters may also change over time. Eye floaters always appear darker than the background and cannot be seen in darkness or with the eyes closed. This is unlike seeing flashes of light, which people often notice in the dark and with the eyes closed. Any eye condition in which the clarity of the vitreous humor is altered can produce the symptom of eye floaters. 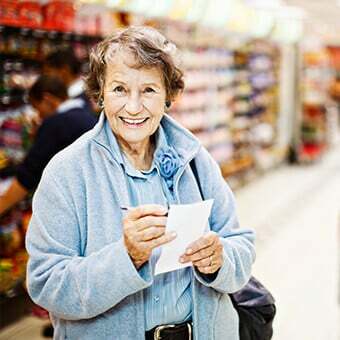 As one gets older, changes normally begin within the vitreous humor. The vitreous gel naturally undergoes some liquefaction, resulting in small pockets of more liquid vitreous lying within the firmer gel. This is called vitreous syneresis. The boundary between each liquid pocket and the gel may be noticeable to the individual as one or more eye floaters. In addition, it is normal for the collagen fibers that are within the vitreous to become thickened and denser with age, resulting in eye floaters. Any person who is over the age of 50 will have these changes within their eyes. However, the degree of eye floaters produced by these typical changes will vary from person to person. As the vitreous normally ages, the gelatinous structure also begins to shrink within the space that it occupies. This shrinkage often leads to the back surface of the vitreous moving forward within that space. The vitreous is normally attached to the innermost tissue of the eye, the retina, at its posterior aspect at the edges of the optic nerve. As the vitreous shrinks, this attachment to the optic nerve may release, and this former attachment now floats within the eye, causing one or more eye floaters that can sometimes seem very large and circular in shape. In addition, the back surface of the vitreous, now floating within the eye, will also cast shadows onto the retina, producing eye floaters. This shrinkage and pulling away of the back of the vitreous is called a posterior vitreous detachment (PVD) or posterior vitreous separation. It is very different from a retinal detachment. About 50% of 65-year-olds will have a PVD in one or both eyes. A person developing a PVD in one eye is likely to develop a PVD in the other eye within the following 18 months. In addition to vitreous syneresis and posterior vitreous detachments, both of which are normal occurrences that cause eye floaters with aging, there are a large number of abnormalities in the eyes that may also cause the symptoms of eye floaters. 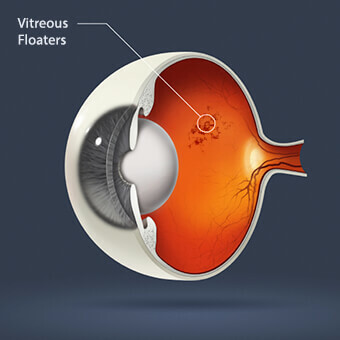 Any cellular material within the vitreous may cause eye floaters. Red blood cells as a result of hemorrhage and white blood cells as a result of inflammation are common types of cellular material causing eye floaters. Hemorrhage into the vitreous may be a result of injury, diabetic retinopathy, a retinal tear through a blood vessel, or eye surgery. Inflammation in the vitreous may be caused by noninfectious uveitis, injury, penetrating or blunt injury to the eye, severe eye infection, or eye surgery. Eye floaters are extremely common in adults and are a leading symptom that causes people to see an ophthalmologist. 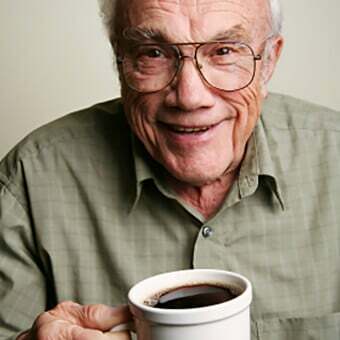 Almost everyone has eye floaters by age 70, although some people are much more aware of them than others. It is unusual for children under 16 years of age to notice eye floaters unassociated with eye disease. Abnormal eye floaters are associated with the retinopathy of diabetes, retinal tears, retinal detachment, and large degrees of nearsightedness. They occur more commonly in people who have had injury to the eyes, surgery to remove cataracts, or YAG laser surgery after cataract surgery. Tuberculosis, sarcoidosis, syphilis, toxoplasmosis, and acute retinal necrosis of the eye are other inflammatory diseases that are associated with eye floaters. An unusual ocular condition called asteroid hyalosis is also a cause of eye floaters. Primary or secondary tumors in the eye, including lymphoma and leukemia, are associated with eye floaters, but these are extremely rare. Increasing age is a significant risk factor for the development of symptoms of floaters. Being nearsighted (myopic) is a risk factor for eye floaters occurring earlier in life. The process of vitreous syneresis is accelerated in eyes that are highly myopic, and posterior vitreous detachments occur at a younger age in people who are significantly nearsighted. Diabetes is a risk factor for the development of eye floaters that arise due to diabetic retinopathy. Eye injury is an additional risk factor. Eye floaters can be annoying and may be anxiety-provoking, but by themselves they are not dangerous. The majority of eye floaters are caused by normal aging changes within the eye. However, a person developing the sudden appearance of eye floaters should be checked by an ophthalmologist to make certain that there is no associated eye abnormality or systemic disease that requires treatment. A sudden onset of many eye floaters or the onset of eye floaters associated with flashing lights could signify a retinal tear that requires treatment to prevent retinal detachment. A curtain or cloud in the vision or a loss of side vision could be a symptom of associated retinal detachment. If you develop floaters, you should be examined promptly by a health professional trained in the diagnosis and treatment of eye disease. These include ophthalmologists and optometrists. An ophthalmologist is a medical doctor (MD) who is specialized in eye and vision care. Most ophthalmologists in the United States are board certified by the American Board of Ophthalmology after taking rigorous written and oral tests. They can deliver total eye care, including performing a complete eye examination, prescribing eyeglasses and contact lenses, diagnosing and treating eye diseases, and performing surgery on the eyes and the area around the eye. An optometrist is a doctor of optometry, an OD. To become an optometrist, one must complete a pre-professional undergraduate college education followed by four years of professional education in a college of optometry. Optometrists are licensed by the individual states to practice optometry, just as physicians are licensed to practice medicine by the individual states. 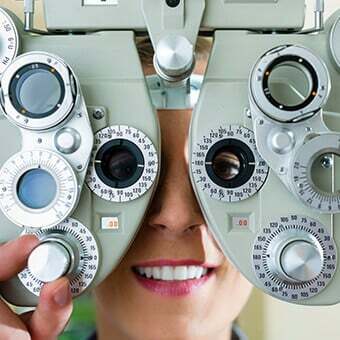 Optometrists can perform an eye examination and can determine the presence of vision-related problems. They can also prescribe eyeglasses and contact lenses. 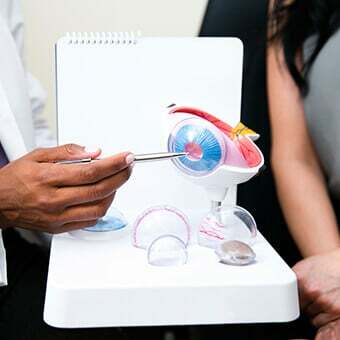 Depending on the state in which they practice, optometrists also may be allowed to treat eye diseases and prescribe eyedrops for various conditions, but they are not trained or licensed to perform surgery in an operating room. It is important that the eye care professional dilate both pupils with eyedrops and examine the entire eye, including the vitreous and the retina, when evaluating a patient with a complaint of eye floaters. When a patient goes to the ophthalmologist with the symptom of eye floaters, the doctor will first ask the patient questions about them. 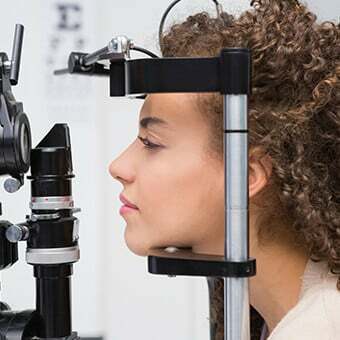 The ophthalmologist will check the patient's central and peripheral vision, look at the front of the eyes with a slit lamp, and then place drops in the eyes to dilate the pupils. 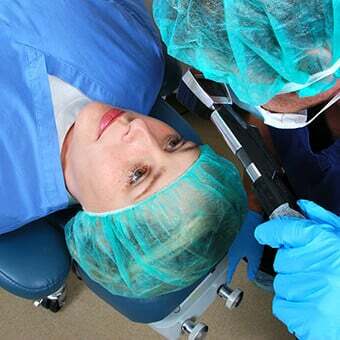 After the pupils are dilated, the retina and vitreous will be examined with bright lights from an ophthalmoscope mounted on the head of the doctor. The ophthalmologist will be able to see the eye floaters themselves and will be able to tell the patient whether there are any associated abnormalities that require further tests or treatments. Most eye floaters decrease in size, density, and darkness with time. Some of this is due to actual absorption of the floater through the natural processes within the eye. Eye floaters may also shift in position within the eye, resulting in less of a shadow effect. In addition, the human brain tends to adapt to and often becomes used to the presence of eye floaters, ignoring them in a manner similar to the way a person only notices the feeling of shoes on their feet when they think about it. Eye floaters eventually tend to become less bothersome, both through reduction in density and size and the above described process of neuro-adaptation. Anxiety about the symptom of floaters can make the floaters more noticeable. There are no safe and proven methods to cure the symptom of eye floaters caused by vitreous syneresis or posterior vitreous detachment. Most will fade over time and become less annoying or noticeable. Learning relaxation techniques may hasten the neurologic adaptation to persistent eye floaters. Although certain herbs, vitamins, home remedies and iodine-containing products have been touted as effective in decreasing eye floaters, none of these have been proven effective in clinical trials. In the unusual cases in which the eye floaters are due to white blood cells in the vitreous from inflammation or infection, appropriate anti-inflammatory drugs or antibiotics will reduce the number of white blood cells. There are no oral or eyedrop medications of value for the reduction of the common type of eye floaters. Abnormal eye floaters due to bleeding in the vitreous from diabetic retinopathy or a retinal tear will decrease as the blood is absorbed. However, the cause of the bleeding must be addressed to prevent additional bleeding or retinal detachment. Breaking up of eye floaters using a YAG laser has been advocated by some ophthalmologists, but there is no conclusive evidence that this procedure is both safe and effective. The use of a laser also poses significant risks to the vision in what is otherwise a healthy eye. The vitreous itself can also be surgically removed by a procedure called vitrectomy. This involves multiple incisions into the eye and is used in situations in which there is a large amount of non-clearing blood or inflammatory debris within the eye. Vitrectomy for the treatment of the common type of eye floaters due to vitreous syneresis or posterior vitreous detachment carries with it a significant risk of cataract formation or retinal detachment and a small but significant risk of serious infection or bleeding within the eye. In the past few years, use of smaller caliber instrumentation for vitrectomy and the performance of partial vitrectomy for vitreous floaters has reduced, but not eliminated those risks. There is no known way to prevent normal eye floaters. Eye floaters as a result of injuries can be avoided by wearing safety glasses when working with power tools or protective eyewear when participating in certain sports. The incidence of eye floaters from vitreous hemorrhage in diabetic retinopathy can be reduced by improved control of hyperglycemia (elevated blood sugar). The prognosis for normal eye floaters is good. Well over 90% of people with floaters are not bothered by their presence. Henry, C., et al. "Endophthalmitis following pars plana vitrectomy for vitreous floaters." Clin Ophthalmol 8 (2014): 1649-1653. Webb, B. F., et al. "of vitreous floaters in a community sample of smartphone users." International Journal of Ophthalmology 6.3 (2013): 402-405.